(Nanowerk News) Researchers demonstrate for the first time the potential of existing technology to directly detect and characterize life on Mars and other planets. The study, published in Frontiers in Microbiology ("In Situ Field Sequencing and Life Detection in Remote (79°26'N) Canadian High Arctic Permafrost Ice Wedge Microbial Communities"), used miniaturized scientific instruments and new microbiology techniques to identify and examine microorganisms in the Canadian high Arctic -- one of the closest analogs to Mars on Earth. By avoiding delays that come with having to return samples to a laboratory for analysis, the methodology could also be used on Earth to detect and identify pathogens during epidemics in remote areas. "The search for life is a major focus of planetary exploration, but there hasn't been direct life detection instrumentation on a mission since the 70s, during the Viking missions to Mars," explains Dr Jacqueline Goordial, one of the study's authors. "We wanted to show a proof-of-concept that microbial life can be directly detected and identified using very portable, low-weight, and low-energy tools." At present, most instruments on astrobiology missions look for habitable conditions, small organic molecules and other "biosignatures" that generally could not be formed without life. However, these provide only indirect evidence of life. Moreover, current instruments are relatively large and heavy with high energy requirements. This makes them unsuitable for missions to Europa and Enceladus -- moons of Jupiter and Saturn which, along with Mars, are the primary targets in the search for life in our solar system. Dr Goordial, together with Professor Lyle Whyte and other scientists from Canada's McGill University, took a different approach: the use of multiple, miniature instruments to directly detect and analyze life. Using existing low-cost and low-weight technology in new ways, the team created a modular "life detection platform" able to culture microorganisms from soil samples, assess microbial activity, and sequence DNA and RNA. To detect and characterize life on Mars, Europa and Enceladus, the platform would need to work in environments with extreme cold temperatures. The team therefore tested it at a remote site in a close analog on Earth: polar regions. "Mars is a very cold and dry planet, with a permafrost terrain that looks a lot like what we find in the Canadian high Arctic," says Dr Goordial. "For this reason, we chose a site about 900 km from the North Pole as a Mars analog to take samples and test our methods." 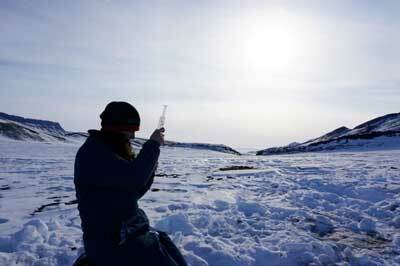 Using a portable, miniature DNA sequencing device (Oxford Nanopore MiniON), the researchers show for the first time that not only can the tool be used for examining environmental samples in extreme and remote settings, but that it can be combined with other methodology to detect active microbial life in the field. The researchers were able to isolate extremophilic microorganisms that have never been cultured before, detect microbial activity, and sequence DNA from the active microbes. "Successful detection of nucleic acids in Martian permafrost samples would provide unambiguous evidence of life on another world," says Professor Whyte. "The presence of DNA alone doesn't tell you much about the state of an organism, however -- it could be dormant or dead, for example," adds Dr Goordial. "By using the DNA sequencer with the other methodology in our platform, we were able to first find active life, and then identify it and analyze its genomic potential, that is, the kinds of functional genes it has." While the team showed that such a platform could theoretically be used to detect life on other planets, it is not ready for a space mission just yet. "Humans were required to carry out much of the experimentation in this study, while life detection missions on other planets will need to be robotic," says Dr Goordial. "The DNA sequencer also needs higher accuracy and durability to withstand the long timescales required for planetary missions." Nevertheless, Dr Goordial and her team hope this study will act as a starting point for future development of life detection tools. In the meantime, the platform has potential applications here on Earth. "The types of analyses performed by our platform are typically carried out in the laboratory, after shipping samples back from the field. We show that microbial ecology studies can now be done in real time, directly on site -- including in extreme environments like the Arctic and Antarctic," says Dr Goordial. This could be useful in remote and hard to sample areas, in cases where bringing samples back to the lab may change their composition, and for gaining information in real time - such as detecting and identifying pathogens during epidemics in remote areas, or when conditions are rapidly changing. And one day it may indeed provide conclusive evidence for life beyond Earth. "Several planetary bodies are thought to have habitable conditions, it's an exciting time for astrobiology," says Dr Goordial.